Englewood resident and concert pianist Carolyn Enger was looking for a way to contribute something to Israel when it occurred to her that the Partnership 2000 program of UJA Federation of Northern New Jersey might be just the vehicle she needed. With the help of Partnership coordinator Machla Shaffer, Enger put together an April visit to Nahariya – the community’s sister city in Israel – allowing her to bring her musical talents to the Jewish state. Enger performed on Yom HaZikaron at Yad Labanim in Nahariya, which contains both a library and a hall for programs. After speeches were delivered, pictures of fallen soldiers were projected onto a large screen. 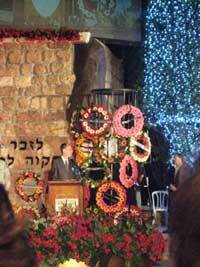 In Nahariya, Enger performed on both Yom HaShoah and Yom HaZikaron. She was also impressed by how many young people were involved in the commemorations. Enger said that while she had prepared an entire program highlighting works by American and Israeli Jewish composers, the Yom HaShoah event included candle-lighting by survivors as well as readings. Her music provided a backdrop for these events. While she was scheduled to perform at the Ghetto Fighters Museum the following day, ongoing renovations there put the piano out of service. She hopes, however, that she will get to play there next year. Enger said her concerts included a piece by contemporary Israeli composer Avner Dorman that had premiered at the New York Philharmonic. “That made it local as well as Israeli,” she joked. The pianist also performed music by the German composer Felix Mendelssohn, who was born Jewish. As part of her visit, Enger met with members of Amcha, which provides psychosocial help for Holocaust survivors and their families. “It has informed my own spiritual journey,” she said, noting that she is now “going through an Orthodox conversion to avoid the question over my head: Is she or isn’t she? Her project, she said, will use art, music, literature, and film to tell the story of this group. “I’m doing research, digging a bit,” she said, adding that many well-known people, such as the poet Heinrich Heine, were mischlinges. Enger said she would like to focus on this group and their experiences before, after, and during the war. Mischlinges did not escape Hitler’s attention, she said, noting, however, that it took him longer to target them. Enger said she absolutely plans to return to Israel next year to offer her gift of music. “They want me to come back and I want to go,” she said.